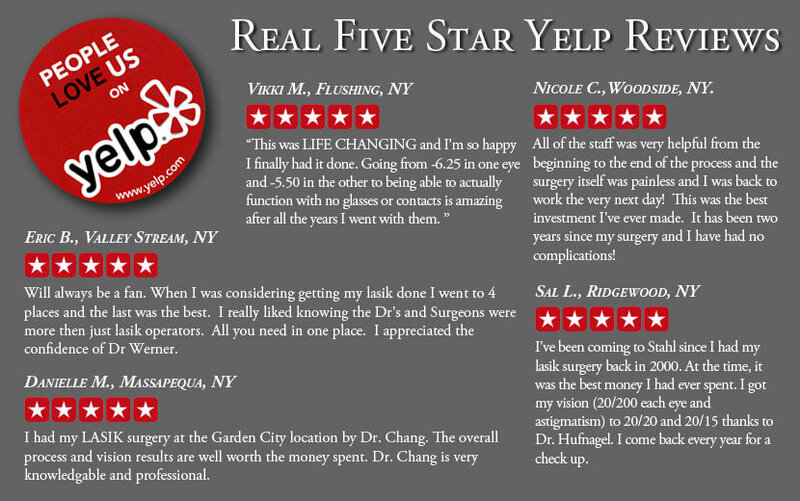 “I would like to applaud your outstanding performance during my LASIK surgery on January 7! I am more than thrilled with the results of 20/20 in my left eye and 20/25 in my right eye! These numbers were given to me in less than 24 hours after my surgery during my postoperative follow up visit. For the first time in about 30 years, I can feel air on my eyeballs! The results are truly amazing as everything is so very sharp. Thank you so much for the wonderful job you do. From the free consultation through the follow up visit, your staff has been extremely informative, encouraged questions, and made me feel as though I was their only patient despite the thousands of patients you care for. As a result of the attitude of Stahl, the LASIK surgery was a very positive experience for me, and because I felt so comfortable with everything and felt fully informed, I was not nearly as nervous as I thought I should be. I was extremely excited and anxious to have the surgery performed. “This is a note to thank you very very very much for restoring my eyesight during LASIK procedures done on March 5th and March 19th. It is like being reborn with new eyes, all of my family and friends are amazed. It has changed my entire life. I passed my driver’s eye test at the DMV on March 25th. Driving is much better now, including night driving. LASIK gives one a sense of freedom I’ve never had before. My children are very happy for me, as is my husband who was very supportive during this time. Little things happen that are very rewarding. For example, our dry cleaner didn’t recognize me for a moment and then he was amazed. He said his son is studying to be a doctor. I told him you were the best doctor of ophthalmology that I know! Our children’s music teacher, Joe, has never heard of LASIK and was incredulous. I had just told him I was having eye surgery and he was asking if I was okay – he thought is was something more serious. He has just bought $500.00 glasses and a year supply of contact lenses. He was wondering if you would put opticians and contact lenses companies out of business! Anyway, if I wasn’t out of room I could tell more stories. “Just a quick note to let you know how absolutely thrilled I am with the results of the second operation on my left eye! I know most people would have been satisfied with the vision I had before the enhancement, but as you said, I’m one of those patients who had to have “perfect” vision. I don’t know if you were reluctant to perform the enhancement, but I’m glad you did it anyway. Not a day goes by that I don’t appreciate the medical “miracle” you performed on my eyes! “For your calming personality, steady hand, wonderful staff and magic laser, thank you so much. Since I turned 10, I’ve been saying that were I allowed one selfish wish, it would be vision. To open my (dry) eyes in the morning and clearly see the twigs on the tree outside my window is a gift – one I’ll never take for granted.